FOR TEENS! 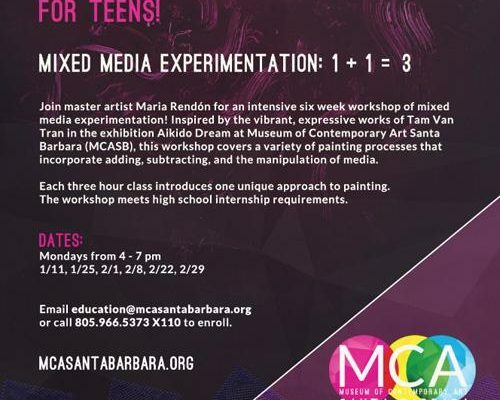 Join master artist Maria Rendón for an intensive six week workshop of mixed media experimentation! Inspired by the vibrant, expressive works of Tam Van Tran in the exhibition Aikido Dream at Museum of Contemporary Art Santa Barbara (MCASB), this workshop covers a variety of painting processes that incorporate adding, subtracting, and the manipulation of media. Each three hour class introduces one unique approach to painting. The workshop meets high school internship requirements. Email education@mcasantabarbara.org or call 805.966.5373 x110 to enroll.